When you see a smile on young children’s happy faces, you just can’t help but notice how white their teeth are. Yours used to be that white, too. But as the years go by, white teeth are hard to maintain. And you might not be the only one who notices. Studies show that a smile is often the first characteristic people see when they meet you. So, having the best looking smile possible is advantageous in both career and social settings. Fortunately, there is a way to brighten your smile. The truth is that no one has a smile that is perfectly white. Everyone’s teeth are genetically programmed to have a slightly yellow, gray or brown cast. This tone becomes more noticeable over the years as the outer coating of enamel on your teeth thins and the layer of dentin underneath begins to show. However, the primary reason most people’s smiles discolor is because of the foods and beverages they eat. Think about what goes into your mouth every day. A cup or two of coffee in the morning, perhaps a turkey with mustard sandwich for lunch, and spaghetti with tomato sauce and a glass of red wine for dinner. All of these are richly colored and can leave deposits on your teeth that add up to a stained smile over time. 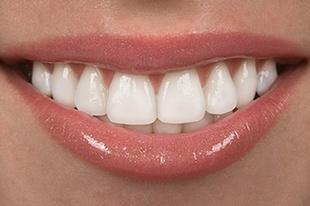 For a more gradual approach to whitening, you will be pleased with the results of our take-home system. With this, we fabricate custom-fitted mouth trays right here in the office. These keep the bleaching solution on your teeth and saliva out. To learn more about porcelain veneers or your options in cosmetic dentistry, you are invited to contact the office of Deer Park Family Dentistry. You can also request an appointment online!